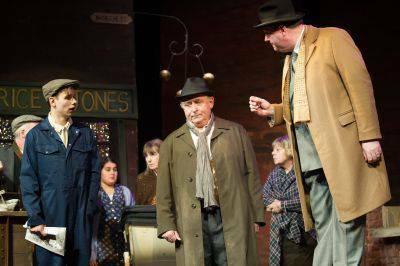 Presented as a tribute to one of the Garrick founding members, Ronald Gow, whose adaptation of Walter Greenwood?s classic won him many plaudits. 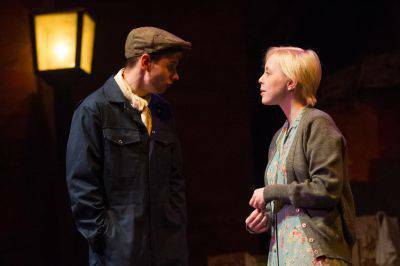 Speaking as powerfully now as when it was first presented in 1931, Love on the Dole follows the struggles of Sally Hardcastle and her family during the great depression that grips the North. Struggling to make ends meet and with her family facing an uncertain future, she is faced with a decision that could ensure her family?s survival, but at the inevitable price of her own happiness. Engaging, gripping and powerful. Northern drama at its very best. For those that would like to know more about Ronald Gow, please click here to view his Obituary from 1993. And Other Members of the Cast. 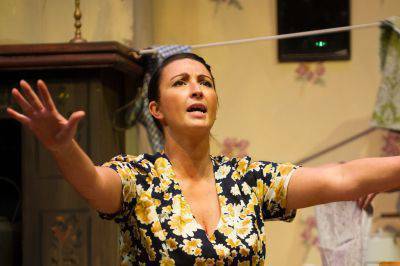 ALTRINCHAM Garrick launches its centenary celebrations in style, with a memorable production of the heart warming and at times heartbreaking northern classic, Love On The Dole. 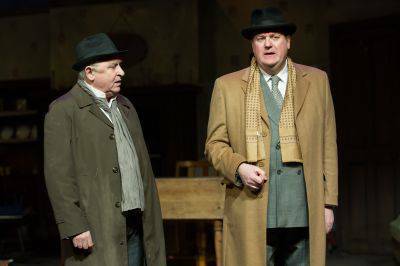 Based on Walter Greenwood?s novel set during the Great Depression, it has been expertly adapted for the stage by one of this theatre?s founder members, Ronald Gow. The script and some exceptional performances make you care deeply about the characters as they struggle to survive on a poverty ridden Salford estate. All of them are disarmingly decent and you?ll find yourselves crossing your fingers for a happy ending. The younger characters still have hope, while the older ones largely seek solace in booze and the supernatural. One minute you?re laughing out loud, the next you?re moved and frustrated by the plight of people who wonder where the next meal is coming from. The best performances? Well, to be perfectly honest there aren?t any weak ones. But I particularly liked Laura Chandler as the heroine of the piece, Sally Hardcastle, a formidable Lancashire lass who dreams of marrying her Larry, a young radical played by Rhys Nutall Chandler and Meath have a strong chemistry and this is replicated by the other lovers in the piece, Harry Hardcastle and Helen Hawkins, played to perfection by Ashley Ball and Jessica Brooks. Unfortunately I don?t have the space to mention everybody, as this production represents a high water mark for this theatre. Go and make the run a sell-out - they certainly deserve it. I?ve a soft spot for Ronald Gow, the writer of Love on the Dole adapted from a book by Walter Greenwood. He taught my father at the Boys Grammar School then called Altrincham High School, and encouraged him to play Shakespeare in a play about the bard. Ronald Gow was a founder member so it is fitting that his greatest work should be shown in the Garrick?s centenary season. 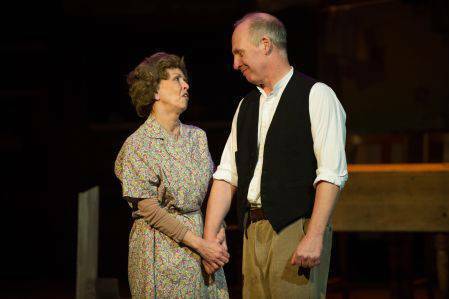 The play is about the struggles to make ends meet of Salford mill worker, Sally Hardcastle and her family who fight for a better life against all the odds during the great depression of the thirties. 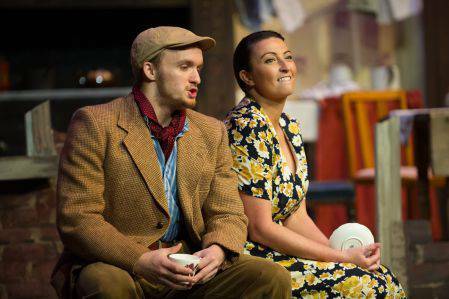 Sally, played movingly by Laura Chandler, bonds with political activist, Larry Meath (Rhys Nuttall). Her brother, Harry, (Ashley Ball) has his own love, Helen Hawkins (Jessica Brooks). Theirs is, literally, love on the dole. Larry is passionately idealistic. He sees only black and white and this is put over well by Rhys Nutall. It is this attitude that ultimately leads to his downfall. The writer illustrates how poverty can affect relationships and director Maureen Casket, ensures the sentiments of the time are conveyed realistically. Laura Chandler brings out the character of the feisty Sally steering her through dreams of a better life, to heartbreak and anger. Ultimately she makes a decision which ensures her family?s survival at the price of her own happiness. I am surprised how funny this production is. I had expected it to be unremitting gloom. But it isn?t. There are lots of laughs. Most of them come from three old women who sit around the Hardcastle?s kitchen table drinking gin. They remind me of Ena, Minnie and Martha in the early days of Coronation Street. Mrs Jike, Mrs Dorbell and Mrs Bull played by Val Watkinson, Pat Williamson and Mags Johnson are a hoot. 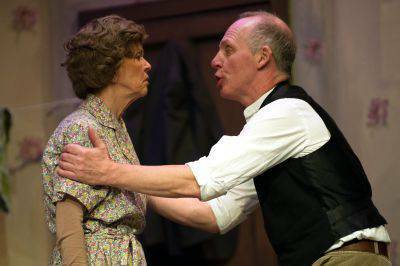 The senior Hardcastles, Henry and Sarah, played by Graham Simmonds and Janet Slade, struggle to cope with their wayward adult children. Yet it is they who ultimately prove that love conquers all. This is one of the finest productions so far this season. Love on the Dole ??LIVE! Regular readers of this blog may remember that the last time I encountered Walter Greenwood?s?Love on the Dole?I was?less than enamored?with it. I found Greenwood?s tale of the poverty stricken Hanky Park slums near Salford to be a bit wearing and in some cases downright irritating. ?It?s been a while since my original delve into Greenwood?s world though ? possibly time enough for me to have mellowed? It is?Love on the Dole?s resonant themes that have made the story something of a modern classic. ?Greenwood?s story was a response to the crippling unemployment affecting the area and follows the Hardcastle family as they are pulled apart ? sound familiar at all? ?Swap out Hanky Park for elsewhere in Manchester and the industrial way of life for call centres and you?re not a million miles away from where we stand today. This version by the Altrincham Garrick is rather special. Not only is it part of their Centenary season, but is written by Ronald Gow, a founder member of the Garrick. Gow?s adaptation was also notably turned into a film with both screen and stage versions taking the country by storm. With relatively few ?classic? 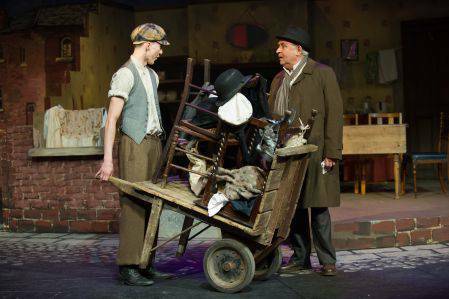 Northern plays to choose from,?Love on the Dole?has endured and stands as a fitting tribute to Gow?s impact on the theatre landscape. Despite Gow?s adaptation being written in 1934, it?s lost surprisingly little of its punch eighty years on. Of note are Laura Chandler?s Sally and Ashley Ball?s Harry. Young and tempestuous, their anger is barely contained at Hanky Park?s continued poverty. 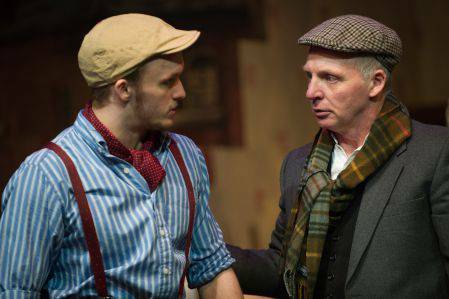 Both long for material possessions to subvert their working class position, much to the ire of proud father Henry (Graham Simmonds) wounding his pride ? already an outdated notion in 1934 and positively archaic now. ?Simmonds performance is masterful, with a deep-seated vein of shame at accepting help buried among his irascible anger. The company provide much of the community feel ? much of them passing each other in the street on Margaret Norris?s superbly designed stage is straight out of classic Coronation Street. 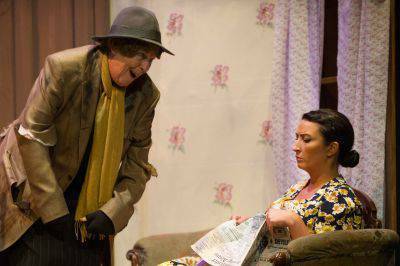 Modern audiences may well assume that the unholy triad of Mrs. Jike, Dorbell and Bull (Val Watkinson, Pat Williamson and Mags Johnson) are based on Ena Sharples, Minnie Caldwell and Martha Longhurst with their gossiping and general hi-jinx. 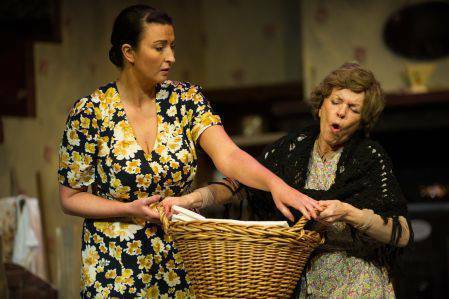 Older audiences however will no doubt nod with how utterly authentic the ladies performances are. It?s a smaller scale type of poverty than in Greenwood?s book. ?Only one character really comes out the other side as a winner, for the rest there is no winning in Hanky Park ? just surviving. ?This stage version sanitises this a little bit with more slapstick humour breaking up the grim outlook. In part it works, but?Love on the Dole?has an important tale to tell, no matter how grim the consequences. Maureen Casket?s direction is at it?s best when aping kitchen sink drama -?confrontational?scenes towards the end of the second Act are pitched nicely with some sharp intakes of breath from the audience. Time will tell for?Love on the Dole?whether or not we look back at it as a charmingly quaint reminder of a bygone age. For now though, it acts as a timely and still relevant discourse of life on the bread line. Looking past my feelings towards Greenwood?s story, you have a solid, rudely stylish and confident production awaiting you at the Altrincham Garrick this week ? a production that ironically enough is perhaps the most relevant of their Centenary season. 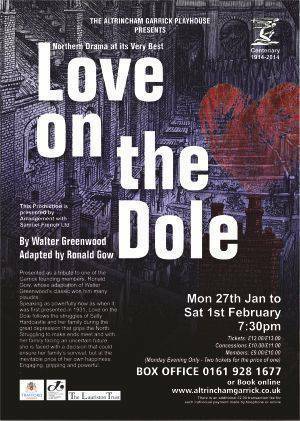 Even though this adapted novel was voted one of the 100 Best Plays of the Twentieth Century, ?Love on the Dole? is one of those works that we might have heard of or known from the 1941 film starring Deborah Kerr but are unlikely to have actually seen. 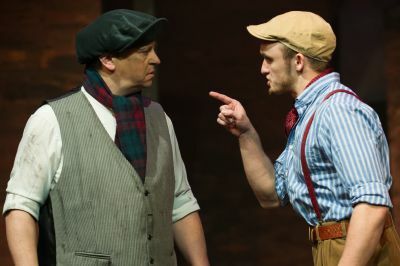 ?It presents a timely reminder that however bad the current recession might be, double dip or not, it is a cakewalk compared to the Depression of the early 1930s, where the dole could be withdrawn leaving families to enter the workhouse or starve. The majority of the play is set in the cramped living space of the Hardcastle family home, we gradually see their possessions disappear throughout the play as they?re (suggestively) pawned for the little they?re worth. The Hardcastle?s are from Salford's dire "?Anky Park", who are working class and proud of it. The central figure is the strapping Sally Hardcastle, well played by Laura Chandler - in a role I wouldn?t normally expect to see her portray which is always refreshing. 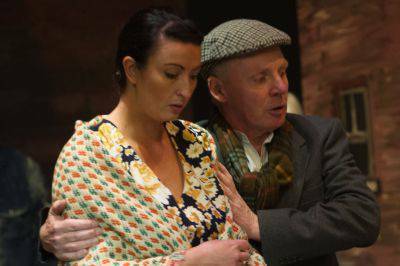 Sally becomes the bedrock on which the household rely, her soul kept together by love for Rhys Nuttall's political agitator Larry Meath. I did find their relationship slightly difficult to believe as their connection didn?t have the spark needed to drive the play, the two often stood holding and swinging their hands as they spoke to one another which conveyed more of a childlike/twee relationship than adoring love, however, both performances as individuals had vitality! Mirroring their courtship is that between Sally?s younger brother Harry and his girlfriend Helen (Ashley Ball and Jessica Brooks). I very much enjoyed Ashley?s performance and am pleased to see another new face in a Garrick drama, a competent young actor who certainly holds his own. Through the play, there is much to try this family. Indeed, they sometimes appeared to be wending their way through an early pilot for Coronation Street, not helped by some melodramatic plotting. Direction by Maureen Casket was sometimes hard to pin point, I was unsure whether she?d instructed some of the players pacing and fidgeting hands as it often didn?t marry with what was going on. Sarah (the Mother), played by Janet Slade, is burdened by a trio of self-proclaimed friends who do a good imitation of a cackling coven of witches. The others suffer unemployment, pregnancy, delayed marriages, hunger, death and in the final reckoning, a fate much worse even than that, at the hands of the local backstreet bookmaker, Nick Sample as Sam Grundy. The set was an impressive, traditional design - though I, personally, think a more contemporary and up to date model would have rocketed this piece out of the dated category making the production furnished for an audience of today. At its best, Love on the Dole is a heart-rending family story that reminds us how lucky we are to be living in our own time. This slightly over fussy revival might have ensured that the play's impact had all of the power that must have been present for those who saw it when life really was like this (and it wowed around a million people in the year or so after it was first performed). Even so, much of the sheer desperation of these blighted Northerners still shone through. The final and most poignant moment in the play as Sarah and Henry are left alone was my highlight, how they shared a moment of hope and painted a positive picture of their future!